Following the announcement of humanitarian relief support in the BVI earlier this year, the Alliance of BVI Professional Services Businesses (the “Alliance”) has confirmed that it has made a donation of USD61,212.50 to the BVI Foundation. 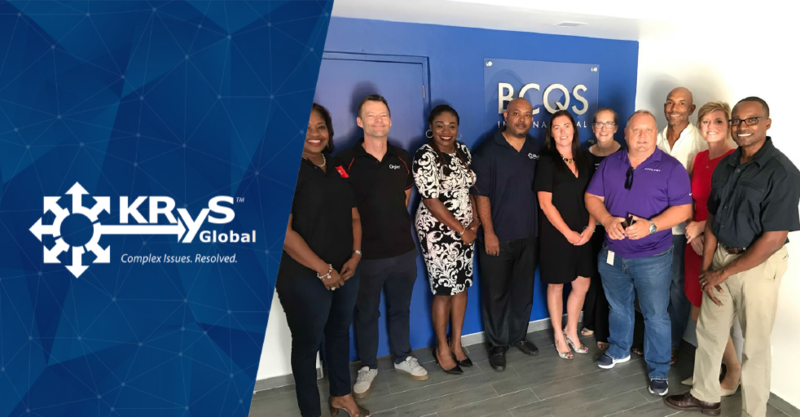 As a member of the Alliance, Krys Global continues to be part of ongoing humanitarian relief in the BVI. Reynold Walters of the BVI office joins fellow representatives of other members to commemorate this event (pictured above). The BVI Foundation is an organisation set up after Hurricanes Irma and Maria to rebuild the local BVI community. The funds will be used to purchase, ship and erect modular containers as temporary housing on land made available to the Foundation in Baughers Bay by the Georges family. The Alliance’s spokesperson, Rachael McDonald, said: “Over 11 months have passed since the devastation of the two hurricanes and we are pleased to say the rebuild of our community is in full swing. This is largely due to organisations and charities, like the BVI Foundation and Adopt a Roof, which are working tirelessly to rebuild not just homes, but also people’s livelihoods. The BVI is an important jurisdiction for the firms in our Alliance and we are honoured to be able to offer our support. The Alliance comprises 19 professional services firms that practice or have offices in the BVI. The group has contributed over USD123,000 in total to both the BVI Foundation and Adopt a Roof – two local charities set up to support the BVI community after Hurricanes Irma and Maria. The funds are being used to support the ongoing humanitarian relief effort to rebuild the BVI. Chair of the BVI Foundation, Dr Annelise Wilkins, said: “We would like to thank the BVI Alliance for their generous contribution to our ‘temporary housing’ and ‘work to build’ projects. There are still 32 people living in shelters on Tortola almost 10 months on from the impact of hurricanes Irma and Maria and many more living in substandard, unsafe accommodation despite an impending hurricane season. Individually, the Alliance members are also supporting other appeals as well as carrying out their own relief and recovery efforts.